It looks as if a final public hearing on the big railway-based expansion plans of Baffinland Iron Mines Corp. won’t happen until the fall of 2019. 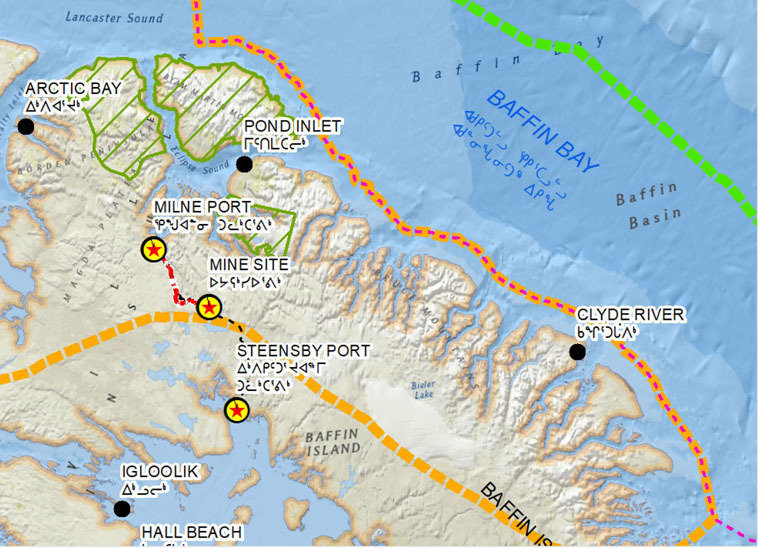 This past October, the Nunavut Impact Review Board released a proposed schedule for its environmental assessment of the project that would see a public hearing in Pond Inlet between May 7 and May 11 and a recommendation going to the Northern Affairs minister by June 25. But now, even Baffinland, which has proposed the plan since 2016, says more time should be added to the process. The company, in a letter dated Jan. 29, now proposes pushing the Pond Inlet public hearing to between Sept. 16 and Sept. 20, with a report to the minister by Nov. 4—about two weeks after the Oct. 21, 2019, federal election. Baffinland said the summer months are not a good time for a public hearing, due to the large number of people who are out harvesting and camping at that time of year. And regulatory stakeholders, including the Qikiqtani Inuit Association and the federal government, say they need more time to review important technical information from Baffinland, as well as Baffinland’s updated environmental management plans. “QIA is acutely aware of how significant the impact of phase two could be on Inuit, particularly in Pond Inlet,” the QIA said in a letter on Jan. 24. “Inuit have serious concerns about the current operation of Mary River now, and it is possible the review of this application could find that Inuit are not ready to engage in phase two, both due to review process timing and the complexity of the impacts associated with the proposed scale of the application,” the QIA said. “Phase two” is the name that regulators use to describe a Baffinland plan that would see a large expansion in ore production powered by a 110-kilometre railway running from Mary River northwards to Milne Inlet. The federal government agrees with the QIA on the need for a longer process. A Yellowknife-based entity called the Northern Projects Management Office, which operates under the Canadian Northern Economic Development Agency, told the NIRB that federal departments need more time to look at technical matters. And they also say that it’s essential that they get at least four weeks to look at updated management plans that the company is expected to provide. Under its Phase 2 proposal, Baffinland’s railway to the north of Mary River would likely start operating by 2021 and accommodate a total fleet of five locomotives and 200 cars. Building the railway would require multiple quarries and at least 12.7 million cubic metres of rock fill. The review board has yet to issue a revised schedule for its environmental assessment of Baffinland’s expansion plan.